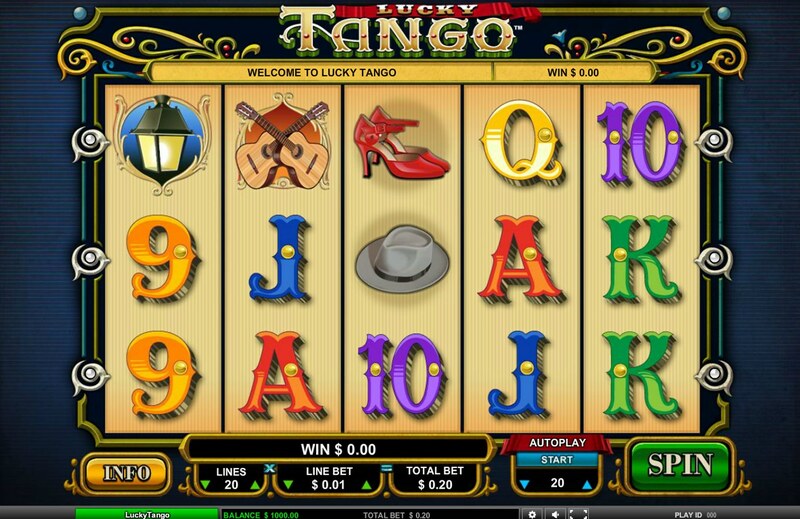 If you've ever enjoyed the humor and 3D Latin-tinged delights of Betsoft Gaming's At the Copa video slot, you'll get a kick out of developer Leander Games's (slightly simpler) Lucky Tango. Set in the world of a hot and steamy Latin dance club, the reels are full of appropriate symbols like acoustic guitars, a rose, the male dancer's hat, sultry lamps, the female dancer's red Stilettos, and the regular 10-through-Ace symbols. The red rose, more commonly to be found clenched tightly in the Tango dancer's teeth, is the game's Wild and substitutes for all regular symbols in the game other than the Scatters. In customary Leander style, five Wilds across the reels pays out the generous top whack of 5,000x your line bet. The Scatter is the accordion, boosting any wins when you hit three or more on the reels, but it’s the Bonus icon you should pay particular attention to. The couple dancing acts as the game’s feature bonus symbol, and when three of these appear anywhere on the reels the free spins feature will be triggered. 15 to 30 free spins will be yours depending on how many Scatters you hit, and to add to the excitement extra Wilds appear after your first spin to add cash to your bonus. The spins can also be re-triggered during the round. There's a nice, friendly range of betting in the game - coin bets range from $0.01 to $10 - and with Leander's customary nice jackpots the game really delivers. 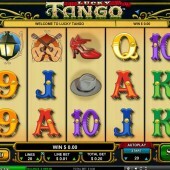 Lucky Tango may not boast the innovation shown in some of Leander's other games, but for a simple Latin-themed online slot, you can't go too wrong - you certainly will know that you’ve been Tango’d. For another great taste of the Latin spirit, make a beeline for the Fiesta-themed delights of Playtech's Samba Nights, which is packed with girls, music and festival fun.